My son recently bought a little boat so he could go out on the Intracoastal Waterway (ICW) and do some fishing. 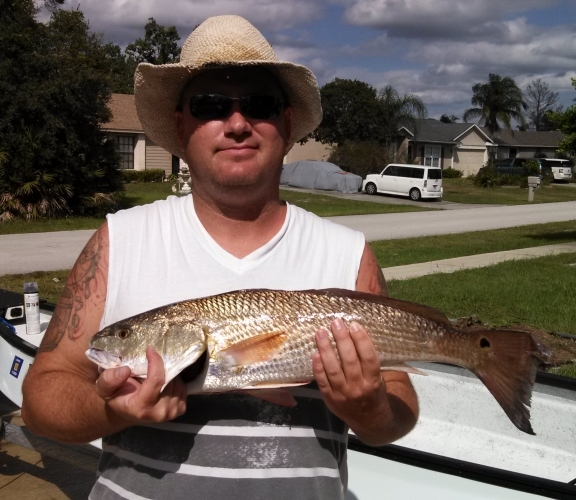 One of the most sought after fish on the east coast, around Mosquito Lagoon, is the Redfish. My son was lucky the other day and caught one that is the perfect size to keep. He brought it home and ate it and said it was delicious. I think they are really gorgeous looking fish with that shiny reddish silver and the distinguishing black dot on the tail. Only one fish per person per day is allowed (I believe) and they can’t be over or under a certain size. This one is just about right. Anything much bigger is not allowed to keep and won’t be all that great eating I guess. I’m not a fishing expert, but thought I’d share this image with anyone who loves to fish in Florida. He was using frozen shrimp for bait, I think.